A defiant Gujarat government today rejected a magisterial report which said that 19-year-old college girl Ishrat Jahan and three others, dubbed as LeT operatives, were killed in a fake encounter and decided to challenge it in a higher court. The Narendra Modi government also came to the rescue of police officers accused of executing the 'fake' encounter saying they were not given a chance to defend themselves. "Magistrate S P Tamang's report is bad in law and he has overstepped his jurisdiction by submitting his report even before a high-level committee appointed by the high court to probe the matter could do so. We will challenge it in a higher forum," Gujarat government spokesman Jaynarayan Vyas said assailing the judicial inquiry report. "The report prepared by the magistrate is beyond the jurisdiction of section 176 CrPC (inquiry by magistrate into cause of death) and will not stand legal scrutiny," he told a news conference. Vyas claimed the magisterial probe did not take into account the facts about Ishrat and three others -- Javed Ghulam Sheikh alias Pranesh Kumar Pillai, Amjad Ali alias Rajkumar Akbar Ali Rana and Jisan Johar Abdul Gani -- killed in an encounter on the outskirts of Ahmedabad on June 15, 2004 before arriving at the conclusion that it was fake. "The facts about the four have been stated in an affidavit submitted by the government of India in the Supreme Court during the hearing of a petition by Ishrat's mother Shamina which said they were Lashker-e-Taiba operatives," Vyas said. "Also, the inquiry has been done under section 176 of the CrPC, which is meant for custodial death. Here there is no custody and therefore the inquiry does not fall within the jurisdiction of that section," Vyas said questioning the wisdom of conducting the inquiry under that law. The spokesman contended that when an HC-appointed committee headed by an officer of the rank of Additional Director General of Police was probing the matter and was asked to submit its report by November 30, a parallel inquiry by a magistrate was not in order. "The High Court is a superior authority and inquiry ordered by it should have prevailed. An inquiry by a superior authority should have naturally taken precedence," he said. The state government's decision drew the ire of Congress which said, "It has become increasingly evident that there is a man-eating government in Gujarat." Congress spokesman Manish Tiwari said in New Delhi that the Supreme Court or the Gujarat High Court should take suo motu cognisance of all encounters from 2001-09. The inquiry report had concluded that the "fake" encounter was "planned and executed" by several top police officers including the then city Police Commissioner K R Kaushik, JCP (crime branch) P P Pande, Suspended DIG D G Vanjara, the then ACP G L Singhal and ACP N K Amin for "selfish motives" like securing promotion and appreciation of Chief Minister Modi. Vyas said the affidavit filed by MHA with regard to Ishrat and three others states that Javed was in regular touch with Lashkar-e-toiba (LeT) operatives to carry out terrorist attacks in Gujarat and other states. "Union of India in its affidavit has stated that it was also aware of the inputs that LeT was planning to assassinate some top level national leaders and that the proscribed outfit had asked its operatives in India to monitor the movements of the leaders," Vyas said. Vyas further said that Javed alias Pranesh Kumar Pillai was born a Hindu but converted to Islam after marriage to Sajida and adopted name of Javed Gulam Mohammad Sheikh. Four criminal cases were registered against Javed in Thane district of Maharashtra between 1992-98 when he was residing in Mumbra, Vyas said. He said the affidavit also mentions that LeT mouthpiece 'Ghazwa Times' had stated on its website that "veil of Ishrat Jahan, a woman LeT operative, was removed by Gujarat police and her body kept with other mujahideens". The affidavit also states that Amjad Ali and Abdul Gani were Pakistani nationals and had entered India to organise terrorist attacks in Gujarat and Maharashtra, Vyas said, adding that Amjad was earlier arrested in Jammu and Kashmir and later released. Meanwhile, Leader of Opposition Shaktisinh Gohil told media persons that the judicial inquiry has brought out the truth about the fake encounter naming the police officials responsible for staging it. "In 246 page report, the magistrate, who conducted the inquiry, has evaluated the evidence and material and came to a conclusion that it was a fake encounter," Gohil said, adding, "The magistrate has stated that it is a case of custodial death as the deceased were already in the custody of police." Reacting to the state government, Gohil asked why the state government is disowning the report of its own judicial officer? 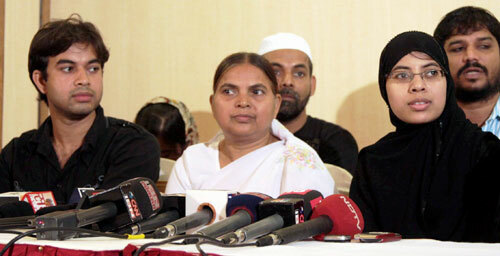 The mother of Ishrat Jahan, demanded stringent punishment to all those involved in the killing of her daughter. Right from Mumbra Police, who picked up Ishrat from her home, to their counterparts in Ahmedabad, who 'killed her in cold blood', everyone did it for publicity, she alleged. Shamima told the news conference that the career of her other children got ruined as their family was ostracised. "I cannot explain the trauma we had to undergo (because of the stigma of being associated with a terrorist). My other children wanted to pursue their studies but could not," she said. "We stand vindicated. We had known from the very beginning that Ishrat is innocent and that the police killed her as part of a well-hatched conspiracy. She loved her country like anybody else," Ishrat's sister Mushrat said. "We want all those responsible for bringing upon us the tragedy to get the most stringent of punishments," Shamima said, adding, the family would not at least have to live in ignominy although a deep sense of loss will be always there. Father of Javed Ghulam Sheikh said, "I always believed that truth will be known one day." He in his petition, demanded that the investigation into the death of his son be transferred to CBI as the officers of the present probe agency were themselves involved in the alleged fake encounter. He said tainted police officers, D G Vanzara and N K Amin, who are behind bars in the Sohrabuddin Sheikh fake encounter case, were also involved in the killing of his son. "The truth can never come out since the very team which carried out the fake encounter would not certainly bring out the truth," he said in his petition.